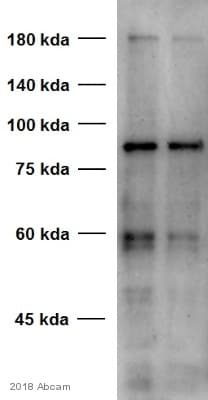 ab31370 detects endogenous levels of STAT3 protein around Tyrosine 705. Synthetic peptide corresponding to Human STAT3. Immunogen range is from aa 672-721. Synthetic non-phosphopeptide derived from human STAT3 around the phosphorylation site of Tyrosine 705. Our Abpromise guarantee covers the use of ab31370 in the following tested applications. WB 1/500 - 1/1000. Detects a band of approximately 95 kDa (predicted molecular weight: 88 kDa). 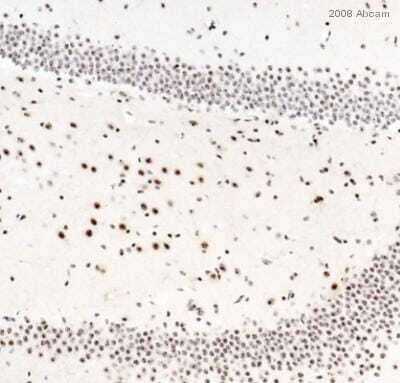 Immunohistochemical analysis of paraffin-embedded breast carcinoma. 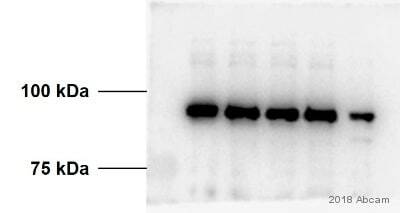 Left: Using anti-STAT3 antibody(ab31370, diluted 1:100); Right: The same antibody preincubated with synthesized peptide. Publishing research using ab31370? Please let us know so that we can cite the reference in this datasheet. I have a question regarding the treatment of tissue prior to applying the primary antibody. Do you recommend microwave? Enzymatic? The tissue I have in mind is human salivary gland. I'm planning to use ab6672, ab59389, ab39636, ab32101, ab31370 and ab30646. Different recommendations? Thank you for contacting us. 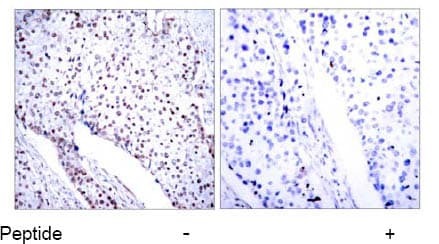 The treatment of PFA-fixed, paraffin embedded sections (IHC-P) before incubation with priamry antibody would include antigen retrieval, blocking of endogenous peroxidases (if HRP is being used for detection), and blocking of non-specific proteins. Here are the protocol details for the respective antibodies: ab30646, ab31370, ab39636, ab59389: 1. antigen retrieval: 10 mM citrate buffer (pH6.0) boil in pressure cooker 2. block with 3% H2O2 (in fresh methanol) for 15 minutes at room temperature 3. block with 3% BSA in TBS for 30 minutes ab6672: antigen retrieval: citrate buffer pH 6 and proteinase K digestion have been tried successfully as well as no antigen retrieval. 2. block with 3% hydrogen peroxide for 10 min 3. block with 1-10% Serum for up to 1 hour ab32101: 1. antigen retrieval:10 mM Sodium Citrate Buffer, pH 6.0 in rice cooker 2. block with 3% hydrogen peroxide for 10 min 3. block with PBS + 10% serum I hope this information is helpful to you. Please do not hesitate to contact us if you need any more advice or information.